Alexandra Paliwoda's hand-forged trivet is a personalized heirloom-in-the-making. A horseshoe is both an iconic good luck charm and a reminder of simpler times. Blacksmith Alexandra Paliwoda takes real horseshoes and adds embracing bands of metal that form a heart with curlicue flourishes. Blending beauty and utility, the trivet protects your table and countertops, but, when not in use, it's elegant enough to display for a touch of rustic romance. Personalize it with your choice of initials, a special date, or both for a memorable wedding gift or heirloom-in-the-making. Handmade in Teton Valley, Idaho. 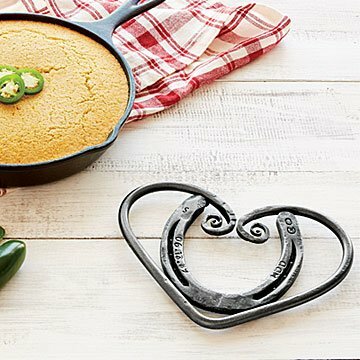 Combining form and function, the Personalized Horseshoe Horse Trivet looks equally charming when it’s holding a home cooked casserole or hanging above your kitchen table. The horseshoe stands as a welcoming symbol of luck, while the heart provides a curling frame that’s both romantic and rustic. There's one place—and only one place—where you'll find the Personalized Horseshoe Heart Trivet: UncommonGoods. This trivet was the perfect gift, unusual but practical. Thank you for your gift(s), your uniqueness, your quality of products. Rock on! My Sister and Brother In Law loved the horseshoe in the heart. I would put this on my bedroom door or wall . Horse shoes are supposed to be good luck plus they are surrounded by a heart what's better than that. This was unique and creative for my brother! I look for something perfect for each person. They like the idea of using it as a trivet, but have considered hanging it as well. This will hang on a wall when not on use as a trivet. My late beloved husband would have loved this!